Unreliable and erratic as my postings have been recently, I think it fair to point out that I'm not going to be able to post anything for at least the next 6 weeks, as I'm off round Europe. Quite surprisingly, as far as I can make out, there are a couple of hundred individuals who have passed through and continue to return here - so thank you all for your attention. I hope to be posting again at the very end of October, or maybe the beginning of November. I shall be back with the thrillingly sordid tale of Jeremy Thorpe: rent boys, politics, attempted assassination and unnecessary cruelty to dogs. As far as closeted political drama goes, it beats several types of weak piss out of some pathetic American foot-tapping in a lavatory stall. 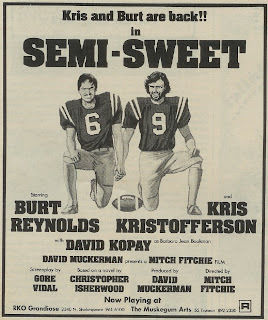 A reasonable parody of the sort of buddy movies that the late 70s sprouted like mushrooms. They did indeed all seem to star either Burt Reynolds or Kris Kristofferson. David Kopay was an American football player who came out in 1975. Gore Vidal and Isherwood as screenwriters for this aren’t very plausible, but this largely indicates that the authors can’t think of anyone else who might reasonably be expected to write this gay buddy film. Vidal and Isherwood are just the only names available – we’re just lucky they didn’t rely on Liberace or Tiny Tim. America’s sports are integral to America’s ideas and expression of its masculinity. Unlike most European sports, baseball and American football are about sheer grunty muscle mass. American football consists of massive specimens of meaty neanderthalism crashing into each other for short periods of time, with game-play interrupted by lengthy intervals allowing for the alternating distractions of jiggly pom-pom girls or beer adverts. 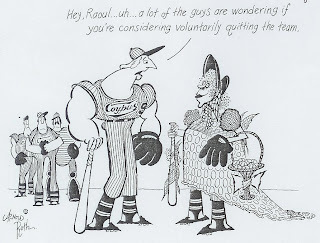 Baseball is all about the necessary resources of intense upper body strength to facilitate hitting a ball with a stick. If your average Ameri-gay is often bigger than his Euro-poove counterpart then it is because the body-ideal exemplified by their national sports are so different. Ideals of attractiveness are often moulded during adolescence, and just compare the difference in builds between an athletic American high-schooler and his continental equal. It doesn’t necessarily have all that much to do with what’s above, but it’s an observation from last spring when I was in Los Angeles, and I was struck by how positively anorexic I seemed in comparison to everyone else. The Champ was a national hero. He became a TV personality, and his stock in trade was a poignant almost incredible, ignorance. He was good-natured and lovably stupid - and, boy-oh-boy, was he tough! Well, Grand got through somehow, put his cards on the table (two million, tax-free) and made an arrangement whereby the Champ would throw the next fight in a gay or effeminate manner and, in fact, would behave that way all the time, on TV, in the ring, everywhere - swishing about, grimacing oddly, flinching when he struck a match, and so on. The next big bout was due to go quite differently now. The challenger in this case was a thirty-three-year-old veteran of the ring named Texas Powell. Tex had an impressive record: 40 wins (25 by K.O. ), 7 losses and 3 draws. He had been on the scene for quite a while and was known, or so the press insisted, as a 'rugged customer', and a 'tough cookie'. 'Tex has got the punch: they said. 'The big if is: Can he deliver it? Will he remain conscious long enough to deliver it? There's your Big If in tonight's Garden bout!' Well, the fix was in with Tex too, of course - not simply to carry the fight, but to do so in the most flamboyantly homosexual manner possible. 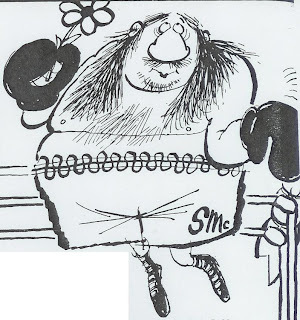 And finally, a fix - or zinger, as it was called in those days - was in with the Commission as well, a precaution taken under best advice as it turned out, because what happened in the ring that night was so 'funny' that the bout might well have been halted at the opening bell. Fortunately, what did happen didn't last too long. The Champ and the challenger capered out from their corners with a saucy mincing step, and, during the first cagey exchange - which on the part of each was like nothing so much as a young girl striking at a wasp with her left hand - uttered little cries of surprise and disdain. Then Texas Powell took the fight to the Champ, closed haughtily, and engaged him with a pesky windmill flurry which soon had the Champ covering up frantically, and finally shrieking, 'I can't stand it!' before succumbing beneath the vicious peck and flurry, to lie in a sobbing tantrum on the canvas, striking his fists against the floor of the ring - more the bad loser than one would have expected. Tex tossed his head with smug feline contempt and allowed his hand to be raised in victory - while, at the touch, eyeing the ref in a questionable manner. Apparently a number of people found the spectacle so abhorrent that they actually blacked-out. “The Magic Christian” was a cult book of the ‘60s. Guy Grand is a multimillionaire, who uses his wealth to practise assorted anarchic practical jokes upsetting society’s standards, all to prove that people will really do anything when offered enough money. Here, Southern undermines the fetished masculinity of popular sports, in this case professional wrestling. At this relatively early date, knowing that he is writing only for a minority hip readership, Southern can afford to be quite explicit about what he means by gay. In 1959, Southern can, slightly smugly, think that a public display of sissiness is enough to outrage and shock his fictional lumpenmass. When the book was adapted for film in 1969 the stakes had to be upped and so the sketch ends with the two boxers kissing each other. This was supposed to accompany an article about a more artistic appreciation of boxing. However, McMurtry’s boxer is more “artistic” then artistic. And I think this just about wipes up pretty much every other joke about bodybuilders and homosexuality. Hans and Franz were popular recurring characters in the late ‘80s and early ‘90s on “Saturday Night Live”. In comic Austrian accents and padded grey workout suits, they mimicked Arnold Schwarzenegger. The sketches largely consisted of alternating between praising the “plumpitude” of each other’s muscles and denigrating the pathetic lack of definition of assorted “girlie men” (a provocative and leading term, hein?). However homosexuality was usually off the menu, except in this case where an appreciation of Patrick Swayze’s flexibility plumbs hitherto unknown depths. by Harvey Kurtzman and Will Elder. 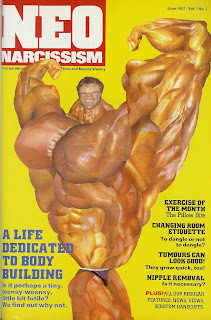 A few relevant excerpts from an instalment of Little Annie Fanny about bodybuilders, inspired by Arnold Schwarzenegger's then novel rise to fame. Kurtzman and Roth flirt with the homo-eroticism that all this preening narcissism suggests. But again, in the final panel, a fag is a sissy, so there’s no confusion. Male narcissism and vanity are terribly dangerous things to provoke and indulge. If a chap wants to confirm whether he’s good looking then he’s simply got to start eyeing all the other fellows up to see if they’re good looking or not. And once you start eyeing up chaps and start deciding whether they’re attractive, well then, it’s almost inevitable you’ll want to start feeling the other chap’s muscles to compare firmness and vascularity. And maybe slipping into posing pouches to compare builds, and then maybe a shared oiling session. And could a buddy help another buddy by giving a hand? And then, well, maybe, ooops, oh dear, I’ll get a cloth. You see the dreadful slippery slope from rugged he-manliness into unspeakable and unnatural depravity. Such a shame. 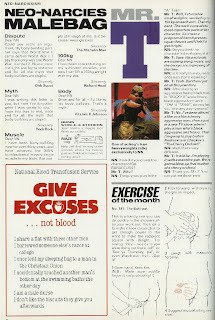 I’m sure I’ve also seen a parody of those “Charles Atlas” ads, where the wimp of the beach after becoming a muscle-man abandons his erstwhile lady companion to go off for some mutual comparison of vital statistics with his muscley former tormentor.